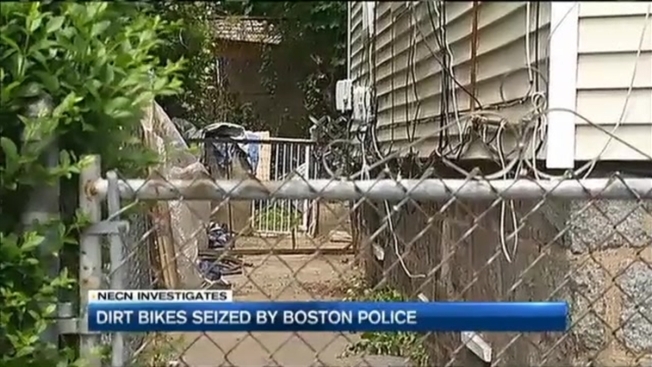 The owners of dirt bikes seized by Boston Police Friday morning on Stonehurst Street in the city's Dorchester neighborhood are furious. "We just want to ride. Let us ride. We just want to ride. Bike life. We just want to ride. We're just trying to have fun," said an anonymous rider. The man says police are overreacting in their city-wide crackdown to get dirt bikes and ATVs off the streets. It's illegal to ride them anywhere but on designated trails, but Lt. Michael McCarthy says some riders are thumbing their noses at the law and have become a menace in close-quarter city neighborhoods. "They're weaving in and out of traffic," he said. "They're riding wheelies down the length of Blue Hill Avenue." Nine bikes and engine parts were seized after police say they got a tip from someone in the neighborhood. They didn't have to catch the riders actually riding the dirt bikes because even storing them against the house is a fire hazard and illegal - good news for one neighbor too nervous about retribution to show his face. "Sixty-five miles an hour here," he said. "We all are parents here. We have kids. We don't need that." Every year, Boston Police say they're going to crack down on these street bikes, but now they say that the crime invovling these bikes is getting more serious, so their crackdown is, too. From January through July of last year, Boston Police say scooters or off-road vehicles were involved in nearly 300 crimes - more than half of the time, they involved a stolen scooter or off-road vehicle. "There's been shootings, there's been robberies," said McCarthy. "They're a mode, a mode of transportation they can come in and out pretty quickly." "If we wanted to go shoot, we would throw up all them bikes, get 'em up out of here - let's go get some guns. We would have been causing hell," said the anonymous rider. During Memorial Day Weekend, a pack of riders illegally tore through the Tip O'Neill Tunnel on dirt bikes and ATVs. The riders performed dangerous stunts, videotaping themselves and then posting to social media. "That was fun. That was good," said another rider. "Keep it up. Sometimes we've got to do stuff like that so we can get recognized." That may well be what police are hoping for in the tunnel incident, anyway – that the riders get recognized. Boston Police and State Police are now working together to catch riders in the act and ask residents with complaints to BPD’s anonymous tip line (800)494-TIPS. The other rider necn spoke with said he was not involved with the tunnel ride.